Plenty of people know when they’ve had a few too many, and they do the responsible thing by letting someone else drive them home. In the age of Uber and Lyft, there’s no excuse whatsoever for getting behind the wheel of a car when you’re drunk. Of course some people have a few drinks and think that they’re sober enough to drive, and those borderline cases are the ones that get responsible people in trouble. Thankfully, there are now tools at our disposal that completely remove guesswork from the equation. 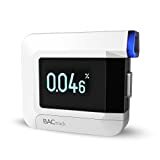 The BACtrack C8 Personal Breathalyzer is small enough to fit in your pocket and it has the same type of accurate sensor used by law enforcement. This model also have a fantastic extra feature though: It gives you the approximate amount of time it’ll take before you’ll be sober again. PROFESSIONAL-GRADE ACCURACY – Powered by BACtrack’s patented BluFire Fuel Cell Sensor, the BACtrack C8 utilizes the same pro-grade technology trusted by hospitals, clinics, and even law enforcement. DUAL-MODE OPERATION – Choose “Standalone Mode” and your BAC results are delivered directly to a bright, easy-to-read OLED screen. Alternatively, choose “App Mode” and the BACtrack C8 wirelessly delivers your BAC results to your smartphone via Bluetooth. ZEROLINE TECHNOLOGY – With BACtrack’s innovative ZeroLine technology, you’re in control of your night. After your BAC results are delivered, ZeroLine estimates the time until your BAC is 0.00%, allowing you to quickly and easily know where you stand. ULTRA-PORTABLE – One of the smallest police-grade alcohol tester ever created, the tiny BACtrack C8 weighs only 2 oz. It’s small size makes it easy to put it in your pocket or purse and have it with you any time you drink! 30 DAY MONEY-BACK GUARANTEE & ONE YEAR WARRANTY – We stand by all our products, but if you are unhappy with your BACtrack, you may return it any time during the first 30 days. All BACtracks also come with a one year warranty, no matter where you purchase.